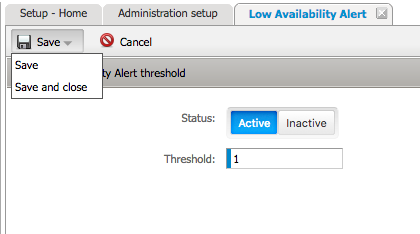 How can I define my low availability alert? HOME > SETUP AREA > How can I define my low availability alert? NOTE : This feature will allow you to get an email notification whenever you have a new reservation and your availability goes below the amount established here. STEP 2 : Enter the value from which you want to be notified, whenever your inventory goes below. For instance, if you want to be notified whenever a room gets fully booked (0 availability), you should enter here the value 1. STEP 3 : Select Status ACTIVE. This alert will only be sent when your inventory is automatically updated by an incoming reservation, not when there's a manual update on REVENUE AREA. The alert will identify the room name and the relevant dates that gone below the value established here.